Looking to propose in the near future? Congratulations! Are you planning on spending more on the engagement ring than you spent on your house? Probably not, but here is a list of some of the worlds most expensive engagement rings for your viewing pleasure. Blue bloods prefer blue sapphire — or at least Prince Charles did when he proposed to Lady Diana Spencer with an 18-carat oval sapphire engagement ring. The blue bauble didn’t mean lasting love for those royals, but don’t count blue sapphire out just yet. Check out this three-stone sapphire-and-diamond ring from House of Taylor. The piece features 8.28 carats of Ceylon sapphires and more than 2 carats of diamonds for a price of $49,500. Diamonds may be the conventional choice for most engagement ring buyers, but since when do millionaires heed convention? Grunge rocker Kurt Cobain gave fellow rocker Courtney Love a 5-carat diamond-and-ruby engagement ring. Unfortunately for Love, the ring was stolen on Valentine’s Day in 1995. Hopefully, prospective buyers of this three-stone oval ruby-and-diamond ring from House of Taylor will have better luck — and some insurance. The piece, which features 12.48-carat Burmese rubies, sells for $63,600. If this ring doesn’t make you green with envy I’m not sure what will. This House of Taylor three-stone emerald-and-diamond engagement ring features 6.84 carats of Columbian emeralds and more than 2 carats of diamonds, all set in 18-carat white gold. For the thrifty millionaire looking for yellow-diamond chic, this 6.10-carat fancy yellow diamond engagement ring from Ross-Simons may do the trick. The ring features a rectangular diamond flanked by two trapezoidal 1.35-carat diamonds as well as 0.35-carat surrounding diamonds. This yellow diamond is anything but mellow. Baseball star Johnny Damon and actors Charlie Sheen and Eddie Murphy have all paired their marriage proposals with yellow diamond engagement rings. 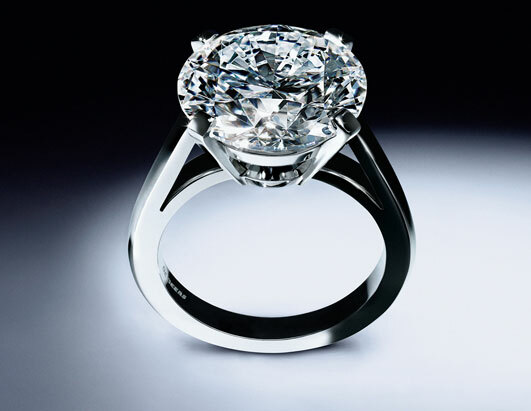 This De Beers 5.11-carat radiant cut ring, set in platinum, costs $400,000. The original Asscher Cut diamond was first developed in 1902, but the design hasn’t languished in the annals of history. Famous Asscher fans include Oscar winner Reese Witherspoon, who reportedly wore a 4-carat Asscher Cut stone on her ring finger while married to actor Ryan Phillipe. But why settle for 4 carats? This 10.19-carat Asscher engagement ring from De Beers is set in platinum and sells for $520,000. Soccer star David Beckham kicked a goal into the heart of wife and former Spice Girl Victoria Beckham with an appropriately posh pink diamond engagement ring. Are you thinking pink, too? 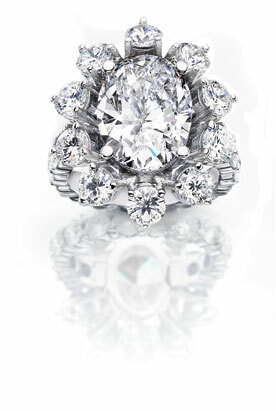 Check out this Secret Kiss of the Rose Ring from De Beers. The piece features 4.15-carat rose-cut white diamonds and a 0.8-carat pink diamond, set in platinum. Just try not to turn pink from the price: $525,000. This platinum-set diamond engagement ring is from the Elizabeth Collection of House of Taylor Jewelry, a Los Angeles-based international jewelry company whose principal shareholders include movie legend Elizabeth Taylor. The 5.98-carat oval-cut diamond in its center is “internally flawless” and surrounded by 3.96 carats of round brilliant diamonds in a floral design. Of course, star power doesn’t come cheap. This ring will cost you a cool $1.3 million. Whether you prefer round extravagance or a more angular glamour, Tiffany has you covered. On the left is the famed jeweler’s oval diamond micromelee split shank ring. Both rings are set in platinum. 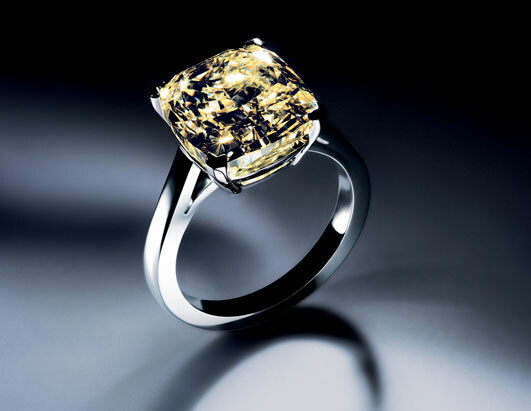 The 14.79-carat creation retails at $1.465 million. On the right, you’ll find Tiffany’s 12.03-carat cushion diamond ring, which sells for $800,000. And the winner is: Number 1. The rock atop this De Beers platinum engagement ring gets a D — as in D-color, the most desirable grade on the diamond color scale. With its round and flawless stone, this De Beers piece weighs just a little more than 9 carats, but if you buy it your wallet might weigh considerably less. The ring’s price is set at $1.83 million. Free FedEx and 30-day returns at Blue Nile! The most expensive diamond engagement ring. This entry was posted in Diamond rings, Emerald engagement rings, Engagement rings, Jewelry engagement rings, tiffany engagement rings, White gold engagement ring and tagged 5 carat diamond, blue sapphire, ceylon sapphires, columbian emeralds, diamond and ruby engagement ring, diamond engagement ring, Expensive Engagement Rings, rectangular diamond, ring features, sapphire and diamond ring, yellow diamond on March 25, 2011 by admin. Wow! The number one ring is stunning! I also like number 4 and number 6, though they’re all beautiful. I’m about to get engaged myself and my boyfriend has given me the go ahead to start looking at rings, so everything is catching my eyes these days. I’ve been looking at rings at this site, Julia’s diamonds and I’m just in love with all of them. I can’t choose!